In March 1944 I received instructions to report to London, from where I and a number of other Naval Officers (all Air Crew, though not for Flying Duties for this appointment) were sent to the headquarters of the Air Defence of Great Britain (HQ, ADGB for short) at the RAF Headquarters at Bentley Priory, Stanmore. For about three weeks we understudied the Naval Liaison Officers stationed there, and got to know the workings of those manning the Plot deep underground. Then we were all dispersed to various RAF units. Some went to RAF stations in the UK, but we more senior ones were primed ready to go to the ‘Far Shore’ with the Allied invasion of Normandy. A couple were attached to an HQ in the American sectors. 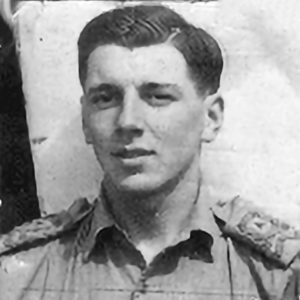 Lieutenant Commander (A) Gerald F Arnold RNVR and I were appointed to the Staff of the Flag Officer, British Assault Area, Rear Admiral Rivett-Carnac, and attached to the mobile HQ of the 24 Base Defence Sector, RAF as Naval Air Liaison Officers. Our naval party included eight Naval Ratings (Telegraphists, etc) and two Royal Marine drivers for our two vehicles. While awaiting events, camping out in the south of England, Gerald and I attended two or three conferences in London, dealing with planning for the Operation NEPTUNE, the seaborne assault phase of Operation OVERLORD. We had been ‘bigoted’, bigot being a higher degree of secrecy than top secret for the planning and preparation for Operation OVERLORD. We were issued with maps of the whole of the north coast of France in one scale, and in a larger scale, the invasion area from the Seine Estuary and Le Havre peninsula to the Cherbourg peninsula. We carried these around with us as necessary, and slept with them under our pillows! Being under canvas we had nowhere to lock them up. On D-Day our landing ship anchored off the beach at Graye-sur-Mer at about 10 o’clock. We were under fire for a time, but were not hit, though several shells landed uncomfortably close! The smaller assault craft went right into the beaches, but to prevent the larger landing ships being damaged or stranded on beaching, the early ones across (including ours) each towed over a Rhino raft, built from many watertight sections joined together, with a ramp forward, and two large outboard engines aft. The ship unloaded onto the Rhino raft, which then ferried the vehicles and men the short distance to shore. It took three trips to unload our ship. We (our Naval Party and others) were on the second trip. On the third trip the Rhino raft ran into underwater explosives, suffered casualties and damage to vehicles and the raft. By the afternoon, when our raft-load went ashore, bulldozers were already at work making roadways up from the beaches. Signposts to the casualty stations, ammunition dumps, fuel dumps, etc, were already being erected, and groups of German prisoners were on the beaches ready to be shipped to the UK. Some of the landing ships carried prisoners on their return trips to the UK, others (including the one which we went in) had medical staff and equipment for transporting wounded. Most vessels (the larger ones) flew two barrage balloons on D-Day, one to be retained for its own protection, the other to be put ashore to protect the beaches from low flying aircraft. The air was full of allied aircraft, but I only saw one German aircraft in daylight on D-Day, a fighter bomber, Focke-Wolf 190, which dropped a couple of bombs on the beach, but as soon as it was dark the German bombers came. Having got ashore, we, (the Sector HQ) were held at up at Graye-sur-Mer for the night, as the Germans were holding out in a wood nearby, barring the way to our setting-up point at Meuvaines. They were dislodged next morning when our infantry went in after a naval bombardment! We then proceeded to Meuvaines, where we set up our HQ. The HQ operations room was formed by three large vehicles fitted out with phone and radio links, etc, forming three sides of a square, with the Plot in the middle. The inner sides of the vehicles were opened up for the Commanding Officer, controllers, Naval and Army liaison officers, etc, to have a clear view of the Plot, which showed the movements of aircraft, hostile and friendly. The 24 Base Defence Sector HQ, with its outlying Ground Control Interception and other radar units, was responsible for controlling the RAF’s night fighter Mosquito aircraft, based in the UK to start with, that were patrolling the assault area. We Naval Air Liaison Officers had radio contact (and, in due course, land line contact) with the naval HQ at Courseulles-sur-Mer, and we directly controlled the ships’ anti-aircraft gunnery when necessary, to safeguard our own aircraft flying over the anchorages. We also carried out general liaison duties between the three Armed Services, and one of us attended the Admiral’s daily conference at Courseulles-sur-Mer. The RAF Air-Sea Rescue launches were also based at Courseulles-sur-Mer, and when they needed to be sent out, we gave instructions via the Naval HQ. In the first few months after D-Day, most of the German air activity was concentrated on laying mines in the approaches to the anchorages. Thus, even when ships were not sunk or damaged, they were held up from bringing in reinforcements and supplies until the mines had been located and cleared. In the 11 weeks that I was in Normandy, our night fighter aircraft shot down more than 100 German bombers operating in the area. At the end of the battle of Normandy, and with the advance of the battle fronts, it was considered unnecessary for one of us liaison officers to be on duty in the operations room all night. (We had done half the night each up until then). So I returned to the UK on 22 August. Gerald remained with the RAF sector, for general liaison duties. About December 1944, he was badly wounded in a German air attack, and was left with a permanent limp from serious leg wounds. We still meet at annual reunions of our wartime Naval Air Squadron which we served in earlier in the war in the African desert.